Finding it a struggle to get the kids to eat a hearty, healthy breakfast? Give them some kitchen role-play toys, encourage them to make a meal for their doll or teddy too and you may soon be in breakfast-eating bliss. 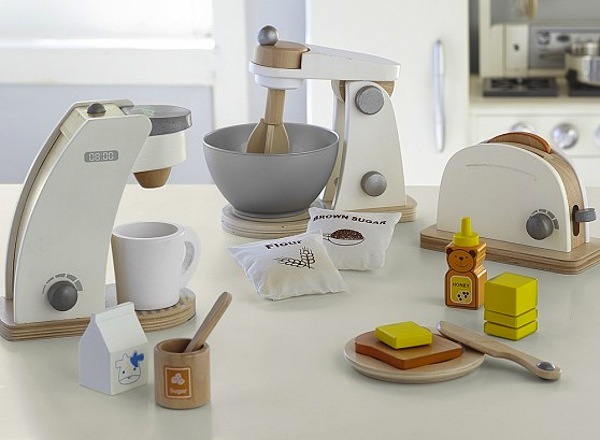 These wooden pretend play kitchen sets come from Pottery Barn Kids and are exactly the type of timeless, quality, stylish design we love here at Babyology. The toaster comes with honey, plate, toast, butter and knife. The mixer set is complete with little sacks of flour and sugar and, my favourite, the coffee maker has milk, a mug, sugar and a spoon. Each set costs $42 and delivery is $12.50 within Australia. Seriously. Small children of parents who have small children are all too aware of the important role coffee plays in most of our lives. I’m on my third for the day (just in case that last sentence didn’t tell you that already) and I love that my little one’s play kitchen may soon be complete with a coffee maker. Oh yeah, also, three cheers for gender neutral cooking toys! Hip hip hooray. If you need more toy food or a toy kitchen to go with your new toy kitchen appliances, browse our pretend play archives.